July 6th dawned much like any other in our house. By 5.00am my workaholic partner Mark was bound for the red-eye to Glasgow, leaving me and our terrier Brodie to doze for another hour or so. My waking thought was ‘Whoopee! Today’s publication day for Seeking Eden!’ But it’s hard to get excited on your own. So, after walking Brodie, in an act of shameless self-promotion, I posted ‘Happy Publication Day to Me’ on Facebook and Twitter. This sparked a flurry of congratulations, likes, loves, and kind comments and I waited to feel different in some way. Two-and-a-bit weeks later, I am still waiting. Or rather I’m not, because I soon realised that there will be no epiphany – no thunderbolt, just a mild sense of personal achievement. 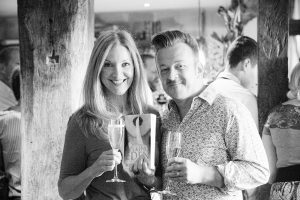 A week later, my launch party was a success – and quite wonderful. I felt blessed to be surrounded by forty-odd friends, family and neighbours, every one of them there to wish me well and congratulate me on getting published. 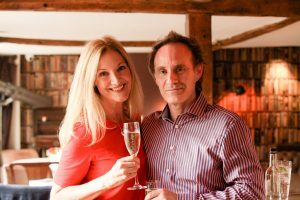 Mark, my long suffering partner, was beyond generous in giving me such a gracious event – the prosecco, conversation and laughter flowed for hours. Matthew Smith, founder of Urbane Publications (the publisher I am signed to) was kind enough not only to give up an evening and come along, but also to say a few words. An accomplished public speaker, Matthew began with the words ‘they say there’s a book inside everyone – for most people it should probably stay there.’ We all got the joke. Speeches and me are not a match made in heaven – put me in a room with lots of people and the phrase rabbit in headlights comes to mind. Nevertheless, I just about managed to squeak some thank yous, before the drinking and volume went up a notch and the book signing commenced. And this was to be the biggest surprise of the evening. Matthew had kindly supplied a box of books should anyone wish to buy on the night. 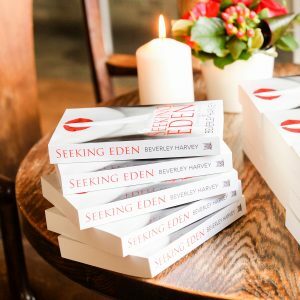 I’d been convinced that only a handful of people would buy Seeking Eden – because either they’d already ordered from Amazon, or because they may wish to buy a copy in the future – but what was the rush? It was a party for goodness’ sake! I could not have been more wrong. Even friends who had already bought and read the book were queuing up for me to sign three or four copies that they were giving to friends and family. It was surreal. I felt daft doing it – and weird knowing that people were paying to read my novel. Somehow, I managed to spend several hours in a room with forty-plus people and speak to no one. I was spinning; vague, vacant, vacuous. I’m glad that the very talented Clair Goble was there to capture the event in photo-form, because I remember so little of the night; everything and nothing. I blinked and it was over. So in lieu of my incoherent murmurings on the night, here are some thank yous. Matthew Smith; you rock for taking a chance on an unknown tentative author who is rubbish at pitching and promotion, but who loves telling stories. Thank you. Mark Payton; what have I done to deserve you? The weight of those wings must surely pull you down some days because you are an angel for sure. Thank you. Marika Cooke; wow! The best bit of PR I could have asked for; thank you for writing a stunning review and background piece in Kings Hill Mums, our favourite community read. David Harvey, Lyn Beer, Ali & Rob Gooderham, Josh, Lewis and Claire: As families go, I hit the jackpot – can’t thank you enough for all your support and encouragement. And to everyone else who celebrated Seeking Eden at the launch party – my goodness, you scrub up well, you beautiful people. Thank you for all your support. A battery of further thank yous can be found on the Acknowledgements page of Seeking Eden. Out now on Amazon, soon to be in WH Smiths and other good book shops. Woohoo!